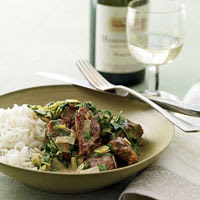 This lemony stew has a delicious mix of spinach, sorrel, watercress, romaine, and herbs. Preheat the oven to 325 degrees. In a large enameled cast-iron casserole, melt the butter in the oil. Season the veal with salt and pepper. Add it to the casserole and cook over high heat, turning occasionally, until browned, 12 minutes. Add the wine, cover with a sheet of parchment paper and the lid and braise in the oven for about 1 hour, until the meat is nearly tender. Add the spinach, sorrel, romaine, watercress, leek, parsley, tarragon, chives, and creme fraiche to the casserole. Stir well; season with salt and pepper. Cover again with the parchment and the lid and braise for 30 minutes longer, until the greens are wilted and the veal is tender. Transfer the stew to bowls and serve with rice. This entry was posted on 10:18 PM and is filed under Veal . You can follow any responses to this entry through the RSS 2.0 feed. You can leave a response, or trackback from your own site.